You certainly don't want to give away your home when selling nor do you want to pay the highest price when buying. Good negotiation skills can take years to develop and tips and strategies come from highly qualified buyers agents and listing agents. But there are ways you can negotiate for the right terms and price in your next real estate deal. Here are 10 tips that all buyers and sellers should know when it comes to real estate negotiations. #1. Be an effective communicator. 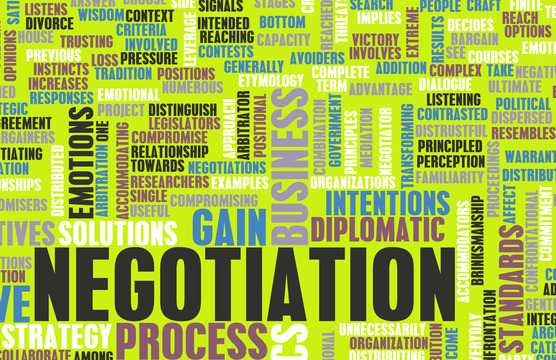 Before you can negotiate anything you need to be an effective communicator. If you don't how to communicate properly, appropriately or accurately, your needs and desires are simply not going to get across. You need to listen, clarify, understand the opposite parties expectations and understand your expectations as well. If you have no idea what an accurate price is for a particular piece of property you are negotiating in the dark. The other party might be laughing at you because you simply don't understand the current market trends and strategies. Understand if it's a buyers market or a sellers market or if the market is balanced. There's no points to request a lower price on a home if the seller has three backup offers over list price. You have to understand what you're dealing with, the current market and how to really get what you want. #3. Who has the leverage. In just about any real estate transaction the leverage either falls to the buyer or the seller. This could mean that the seller is motivated and trying to get rid of the home so they're willing to accept just about any offer or if the seller has multiple offers and the property is only been on the market for a week or so. You have to understand who has the leverage in the transaction and then negotiate on your behalf for the best possible outcome. If you don't understand all the nuances of a real estate transaction you can be shooting yourself in the foot. You don't want to sound incompetent when it comes to real estate terms and transactions so this is really where a buyers agent or listing agent, depending on whom you're using, can really come in handy. You can negotiate the terms with your agent and then have your agent supply the opposite party with the information. #5. Don't waste people's time. If you know that the home will be a hot seller, you don't want to waste any time. The seller will simply find a more aggressive buyer. Similarly, if you're selling your property and you get a decent offer in fairly quickly, don't negotiate for the world. This may be your only offer even if it's just right out of the gate. Negotiate responsibly, reasonably and with appropriate terms. You don't need to go so far out of the realm of possibility that you scare the buyer away completely and then regret not being more reasonable when you have a chance. Don't simply assume that the inspection will allow you to reopen negotiations on other items such as price or closing date. The home inspection negotiations are solely meant for the home inspection. You can ask for certain credit if there are larger problems that you will fix after you close but in a very tight market, you might not get everything you're asking for. One rule of thumb is if you ask for everything you may get nothing. Be responsible, reasonable and appropriate with your request on the home inspection and you might be surprised as to how far sellers will go to appease you. #7. Terms are just as important as price. You're not just simply negotiating the price of the property; you're also negotiating terms such as closing date, downpayments, contingencies or addendum's. It's a unique strategy the balances between the right amount of contingencies and negotiations versus what a seller or buyer will accept. Your real estate agent can provide information and insight on the market in which you're buying and how vital certain negotiation terms will be. Related: What is the Best Day of the Week to List a House? If you go into a real estate transaction assuming everyone's just going to accept whatever you offer and you will be sorely disappointed. Expect a counter offer, negotiations and compromise. You give a little, they give a little and eventually buyers and sellers can meet in the middle where everyone is happy. #9. Find out why the seller is selling. As a buyer, understanding why the seller is selling the property could be a great negotiation tactic. Is there a large freeway going in next to the house? Is it a personal matter such as divorce or lifestyle change? The more you know about the seller the better negotiation strategy you can compile. #10. If you don't ask, you don't get. Regardless of the market, you can always ask for certain things and understand that you may not get it all. Once the transaction is in escrow or "pending" the buyers free to make a certain negotiations when it comes to the inspection and possible alterations to the closing date or details that surround closing. Come with an open mind, be respectful and courteous, and you might be surprised as to what you get. For more information on real estate negotiations, transactions or for tips on buyers and sellers markets please contact our office today.